The berries made me do it. 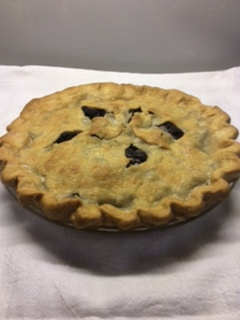 I try to avoid desserts, but the black raspberries in my wild patch between the garage and the garden are so prolific this summer I couldn’t resist making a pie. When I break my no-dessert rule, I tend to do it with flair. But homemade raspberry pie is so spectacular in itself that no flair needed — just crust, berries, sugar, flour and salt. Anything else would be gilding the lily. I got most of my pie-making mistakes out of the way early in my career so that now I can turn out a gorgeous pie with no sweat. Believe me, it took a lot of pies to reach this point, so I’ll share some of my hard-earned tips to make pie-baking a snap for you, too. I usually make pies without consulting a recipe, but I urge you to do as I say, not as I do. For starters, fruits require varying amounts of sugar and thickener (flour, cornstarch, instant tapioca) depending on the type of fruit and how ripe it is. Riper means sweeter, so less sugar is needed. And blueberries, for example, are juicier than raspberries and require way more thickener. Unless you can memorize the proportions for each fruit, at least glance at a recipe when you make a fruit pie. I’m supplying a basic, all-purpose recipe for a berry pie, but by “berry” I mean raspberry, blackberry, boysenberry and other fairly dry berries. Not strawberries, elderberries or blueberries. Then there’s the dough. Its composition is a subject that could fill a couple of columns — more if you take a deep dive into chemistry. Whether to add butter for flavor, lard for extreme flakiness or a combination, or stick with solid vegetable shortening because it is handy, are legitimate questions I won’t explore today. Suffice it to say I usually use shortening because it’s always in my refrigerator.…unless I want to impress, then I use lard. Unless I’m making a tart crust (pate brisee), when I use butter. I am providing basic recipes for a food-processor pie dough and handmade pie dough. Generally, dough that is made by hand with a pastry blender will produce a pie crust that is more tender and flaky than processor-made dough. However, if you freeze the ingredients (including flour) you can increase the quality of processor dough. I am also sharing a recipe I developed once to mimic the texture of the ultra-tender, almost cookie-like crust of the fabulous pies at Waterloo Restaurant in Akron. !. Chill the dough ingredients. 2. Do not knead and squeeze the dough except for the processor dough below. 4. Look up the correct amount of thickener for the type of fruit you use. 5. Add sugar to taste to the filling. 6. Don’t forget a pinch of salt. 7. For the wow factor, brush the top crust with milk and sprinkle lightly with sugar so the finished pie glistens. Combine the flour and salt in a zip-lock plastic bag and place in freezer. Cut shortening into small cubes (about 3/4 inch), wrap in plastic wrap and freeze for at least 30 minutes. This is easier if you use shortening sold in sticks. Add ice water and pulse until most of the shortening is the size of small peas, some a little larger. Divide the mixture between two gallon-size zipper-lock plastic bags (reuse the one in which the flour was chilled). Holding both sides of the bag opening with your fingers, knead the dough through the plastic by alternately pressing it with your fingers and the heels of your hands until the mixture holds together in one piece and feels slightly stretchy when pulled. The dough will be very flaky, but if you adore flakiness, fold the dough in thirds like a business letter and roll with a rolling pin between two sheets of plastic wrap; cover and chill briefly if dough begins to soften. Repeat with second half of dough. Wrap each piece of dough with plastic wrap and flatten into chubby disks. Refrigerate at least 45 minutes or preferably overnight. Roll as described in the recipe below. Stir flour and salt together in a medium bowl. With a pastry blender, cut in shortening until pieces are the size of small peas. Add 7 tablespoons of water while tossing with a fork. If dry crumbs remain in bottom of bowl, add 1 more tablespoon water and toss. Gather dough in your hands and gently shape into two flat balls. With a floured rolling pin, roll dough on a lightly floured surface into two circles about 3 inches larger than the inside diameter of the pie pan (12 inches for a 9-inch pie pan). Continue according to the directions below for Berry Pie. Whisk together flour, sugar and salt in a medium bowl. Add lard and butter in chunks. With a pastry blender, cut fats into flour until bits are about the size of peas. Beat egg and milk together. Drizzle over flour mixture, tossing with a fork. Gather into a ball. Wrap and chill for at least 30 minutes. Divide dough in half. On a well-floured board, roll each portion of dough into a 12-inch circle. Continue according to directions below for Berry Pie. Roll dough into 2 12-inch disks. Roll one of the disks loosely onto your rolling pin and unroll into a 9-inch pie pan. Gently ease dough into the bottom and up and over the sides without stretching. Allow dough to overhang the rim. In a medium bowl, combine berries, sugar, flour and salt. Mix by gently turning over the ingredients with your hands or a spoon. Transfer to the pastry-lined pie pan. Cut decorative slits in the second disk of pastry. Loosely roll onto your rolling pin and unroll over filling. Center the dough disk and turn the edges of the top and bottom disks under together to form a rim slightly larger than the pie pan. Decoratively crimp (press) the dough rim with your fingers or a fork to seal the top and bottom disks together. Brush the top pastry with milk and sprinkle lightly with sugar. Cover the crimped edges all the way around with a strip of foil. Bake in a preheated, 375-degree oven for 25 minutes. Remove foil. Bake 20 to 30 minutes longer, or until the crust is golden brown and the juices are bubbly. Cool for at least 10 minutes before cutting into 6 to 8 wedges. I serve the warm pie in bowls, splashed with cold milk. Two hard-fried eggs on crunchy seeded toast with pesto and blue cheese; barbecued ribs; an almost sugar-free black raspberry pie; hummus and crudities; cold tomato soup with dill, mojo sautéed shrimp. Rotisserie chicken, sautéed kale and cornbread from Boston Market; pepperoni pizza from Rizzi’s in Copley. I am a true lover of good steak tartare, which is extremely hard to find in the Akron or Canton area. We were at Ken Stewart’s Lodge last week for a birthday celebration and, behold, there it was on the menu. It was absolutely perfect and delicious. My hubby and I split one portion of the table-side Caesar, which was quite large. He had steak and frites which came with a whole roasted head of garlic. True heaven. If I had a wish for a last meal, this would be it. Caesar, steak tartare and an extra-dry vodka martini with anchovy or blue cheese olives. There’s a reason they became classics, right? I used to like steak tartare and then carpaccio, and long ago I was crazy about Caesar salad. I think it’s time to resurrect the recipes. You probably can’t answer this recipe question, but here goes. I still miss Jack Horner’s pancakes. The recipe was never divulged as far as I know, but would you speculate on which type of recipe (buttermilk or no, baking powder, baking soda, etc.) so I can experiment in order to recreate them? I thought I remembered a waitress there said club soda was one of the ingredients but it couldn’t have been too expensive a recipe to make, as they made a lot of pancakes for breakfast. Thanks for any help you can provide. I never had the pancakes at the classic Akron restaurant, so I can’t help you. Maybe someone reading this was a cook or waitress at Jack Horner’s and can provide a clue. The hubs and I were SO excited to see that you’d tried Pots & Pans. How was it? We’ve been on the lookout for island fare locally and just learned of P&P this week, and have plans to stop by in the next few days. The best we’ve found to date is actually a quick day trip away, at Ena’s Caribbean Kitchen in the Linden neighborhood on the east side of Columbus. It was featured on an episode of Diners, Drive-Ins and Dives. My guy had the curry goat with rice and beans and fried plantains. I had the Sunday brunch special of shrimp and grits, and let me tell you, I would WALK there on a Sunday just to get that meal again. The sauce was fabulous, the shrimp plump and perfectly cooked, and the Cheddar/smoked gouda grits were drool-worthy. We also shared a spicy Jamaican patty (like an empanada, with a spiced beef filling) while we waited. Two meals and snack came to $22 and we were both so, so satisfied. If your readers are looking for an island taste on their local travels, please send them Miss Ena’s way. I’m a fan of Jamaican food, so I will try Ena’s Caribbean Kitchen. In return, I hope you and others try Pots & Pans in downtown Akron. I wasn’t thrilled with my food there — it needed more spice in the jerk and a better balance of seasonings overall. But I am hoping the food and fumbling service improve, because this family restaurant is the kind of place I like to support. Regarding your item about sauerkraut, my grandmother loved kraut, which she made herself as long as she could. She also developed a taste for canned kraut. But she missed both when she was put on a reduced-salt diet in her 80s. She was smart and inventive about food. She rinsed the kraut many times with fresh water, wrung it out and rinsed some more. With that prep, her doctor approved and she was the most popular person at her assisted living facility. I do the same with green beans, which I love even from the can but which are way too high in salt. A lot of salt-sensitive people are mentally thanking your grandmother for the tip today.